Christina Weiler ’21 believes in the value of waste. The truth about waste, she says, is that it is a part of us, and we are responsible for it. In order to put plastic in a place where it belongs, Weiler came up with the UCan project, a beverage container recycling initiative that gives its proceeds to different local hunger and homeless outreach programs. “UCan’s goal is not just about helping the environment, but also about bringing awareness to different social causes,” says Weiler, who launched the program last fall through Colgate’s Thought Into Action (TIA) entrepreneurship program. Weiler has been further developing the initiative this year with the help of Cornell alumna Eleanore Baughan ’17. Weiler and her team set up 40 receptacles that are available in more than 13 academic and residential buildings as well as two fraternities. After gathering bottles and cans from each receptacle, she takes them to the local redemption center, which reimburses the team $0.05 per container. All the money raised from UCan’s bottles and cans is then donated to local homeless outreach programs, including the rescue mission and an affordable housing project in Utica. “We chose to channel our efforts to Utica because the community is local to Colgate and is undergoing social and economic development,” she explains. “Utica is working hard to create much needed opportunity for residents through affordable housing projects and new local businesses,” Weiler adds. She calculated that, during Colgate’s 30-week academic year, the 2,700 students use approximately 648,000 cans and bottles, which is a $32,400 opportunity. “[Our goal] is to get as close to 100 percent student participation as possible,” Weiler says. If she meets this goal, Weiler hopes to distribute her proceeds to organizations that help people on a national scale, such as Feeding America. TIA played a major role in the expansion of UCan, from accounting workshops and team building to developing proposals. One of TIA’s perks is its seed grant program, where students may apply for up to $1,000. With her seed grants, Weiler has bought receptacles as well as hired a building and grounds officer to drive a truck to the redemption center. After advertising UCan at Colgate’s Student Activities Fair, 59 students signed up to become a part of the UCan team, according to Weiler. With the help from peers, she believes her initiative can expand to other college campuses. 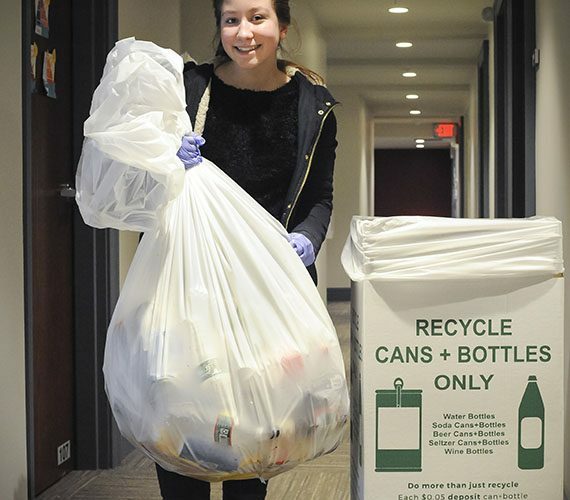 “We hope to reach as many students as much as possible, increase recycling rates on college campuses, and encourage students to make a difference within their community,” Weiler says.